Update: A Facebook spokesperson got in touch to let us know that the company currently has no plans to totally separate Facebook.com from the new standalone Messenger site. "Messenger.com is meant to give people another option for messaging on the web," the spokesperson said. "Facebook Chat is important to us, and we have no current plans to halt our investments in Facebook Chat. I can confirm that we also have no current plans to require anyone to use Messenger.com." So rest easy for now, and keep chatting with your Facebook friends exactly how you have been. Facebook CEO Mark Zuckerberg explained already why he's forcing us to use Messenger, but that doesn't make the haters hate it any less. 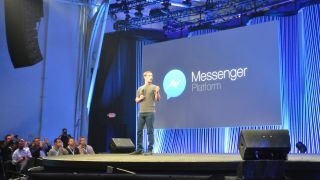 The latest development in the Messenger saga won't do anything for them, but it does give happy Messenger users a way to chat away from Facebook's other distractions. The social network today launched a standalone Facebook Messenger web app that you can access through your browser, eliminating the need to go to Facebook.com to see your messages. This is a positive change for people who enjoy using Messenger, and it doesn't affect those who'd rather it stays the same - unlike with Facebook's mobile apps, users on Facebook.com can currently still see their Messenger chats without going to the external site. But it's not difficult to imagine Facebook eventually pulling the same stunt in your browser that it did on mobile, forcing users who want to send messages away from Facebook proper and into the separate Messenger app. We've asked Facebook to comment on whether that might happen, and we'll update this article if we find out. In the meantime, we know for a fact that Facebook wants Messenger to help it kill email and texting once and for all.